The latest comes via freshly surfaced footage of Madonna performing “Express Yourself” during a rehearsal in Tel Aviv for her MDNA tour. The performance turns into a medley, with Madonna singing the chorus from “Born This Way” before returning to “Express Yourself,” intermingling lyrics from both songs to drive the point home. And then, in the masterfully malicious coup de gras, Madonna weaves in a bit of her own Hard Candy track “She’s Not Me.” The point, we think, is obvious. 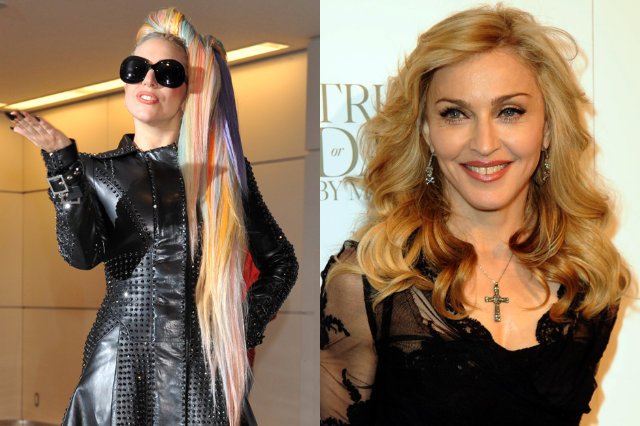 Madonna has been playing cat-and-mouse with Lady Gaga over “Born This Way” for more than a year now. In April 2011, Madonna uploaded her 1989 MTV VMAs performance of “Express Yourself” to her official YouTube account, leading Lady Gaga to tell Jay Leno that Madonna and “her people” had expressed their “love and complete support” for “Born This Way” — not that Madonna’s “people” would confirm this statement.